On this day we remember two specific dates, one that marked the outbreak of war and the other establishing peace. The first event took place on June 28, 1914, in Sarajevo. On that day Austrian Archduke Franz Ferdinand and his wife were assassinated by a Serbian nationalist. Ferdinand, the heir to the Austro-Hungarian Empire, was visiting Sarajevo in Bosnia-Herzegovina to inspect the imperial armed forces. The provinces of Bosnia-Herzegovina had been annexed by Austria-Hungary a few years earlier to the opposition of neighboring Serbia. 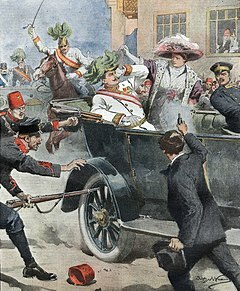 Traveling in a motorcade in a car with its convertible top folded down, the Archduke passed Serbian nationalist Nedjelko Cabrinovic, who tossed a bomb in the direction of Ferdinand’s car. The bomb did not land in the car, however. Instead, it hit the back of the car and bounced underneath a trailing vehicle. The explosion injured two army officers and several bystanders. Continuing in his motorcade unharmed, Ferdinand arrived at Sarajevo’s city hall where he presented a speech. After his speech, Ferdinand insisted he be taken to visit the injured officers. As Ferdinand’s car raced through the Sarajevo streets to the hospital, his driver took a wrong turn. While slowing down to turn around, the car, by coincidence, passed near one of Cabrinovic’s co-conspirators, 19-year-old Gavrilo Princip. Seizing this chance meeting, Princip pointed his .38 Browning pistol at Ferdinand, shooting twice at point-blank range and killing both Ferdinand and his wife. The assassination of Ferdinand was the spark that ignited the powder keg of World War I. Within one month Austria-Hungary, backed by Germany, declared war on Serbia Soon Russia, France, Belgium, Great Britain, and eventually the United States were drawn into the escalating conflict that eventually claimed the lives of ten million soldiers (1). While June 28 marks the beginning of World War I, it is also the date that marks the official end of the war five years later in 1919. While fighting ended in the war with the declared armistice of November 11, 1918, the specific terms of peace had to be written up and signed. To create the treaty, national leaders met at Versailles, near Paris. The key players — David Lloyd George of Great Britain, Georges Clemenceau of France, and Woodrow Wilson of the United States — met behind closed doors to hammer out the terms of what became the Treaty of Versailles. The treaty laid out brutal terms for Germany, requiring them to pay millions in reparations, to forfeit thousands of acres of their land holdings, to plead guilty for starting the war, and to massively reduce the size and strength of their army. Reluctantly Germany signed the treaty on June 28, 1919. Although the Treaty of Versaille brought temporary peace, its harsh terms laid the foundation for future conflicts in the 20th and 21st Centuries, most notable of which was World War II, where a World War I German corporal named Adolf Hitler rose to power, seeking revenge for the unjust terms of the Treaty of Versailles. Logic teaches us about the world; creativity teaches us about ourselves. Once you have crafted your claim, write a paragraph that supports your claim, using contrast, details, examples, and evidence.